My Dog Smiles When She Greets People - Is This Normal? Q. When my dog first greets someone, she shows all of her teeth and “smiles.” Some visitors mistake this for aggressive behavior, but she’s just very excited and happy. What is she doing and how can I explain it to people who visit? A. It sounds like your dog is displaying an appeasement gesture, called a submissive grin, to show you and others that she’s no threat. Submissive grins are a way for a dog to show deference to another individual. Usually submissive grins are associated with increased movement and a body posture that is lower than the dog's normal stance. There are other signals your dog likely uses, along with her submissive grin, to show deference, such as lowering her tail, lifting a paw, licking you, licking her lips and looking away or squinting her eyes. 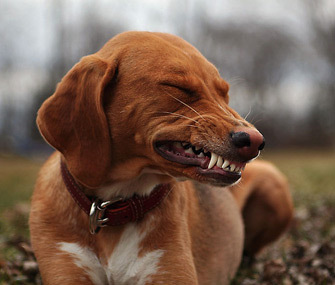 The submissive grin is a tactic dogs use to shut off aggression from another individual, either human or canine. This behavior is commonly seen in greeting situations where the dog is actively soliciting attention in a nonthreatening manner. Often the submissive grin invites interaction from others, but it’s also possible that your dog is trying to increase distance between herself and others if she feels threatened. It’s likely that your dog has continued “smiling” at you and your family because it’s gotten her a lot of attention in the past. You can actually turn your dog’s smiling into a trick by clicking and treating her every time she does it and adding a word to it, such as “say cheese,” just as she starts to smile, which will encourage more of her smiling if this is a behavior you enjoy seeing. It would be helpful to explain to visitors before they meet your beloved canine that she smiles as part of her greeting sequence but is nonthreatening. You can even channel her greeting behavior into another outlet, like a game of ball or a quick series of tricks she’s asked to do, such as sit and down, as a way to redirect her energy away from greeting mode, where she’s likely to smile, and into a different mode, like play or food acquisition. If you doubt that your dog is smiling as a greeting behavior to show appeasement, or if there is any possibility that there may be aggression involved in her behavior, contact your veterinarian, who may refer you to a veterinary behaviorist or a certified professional dog trainer.